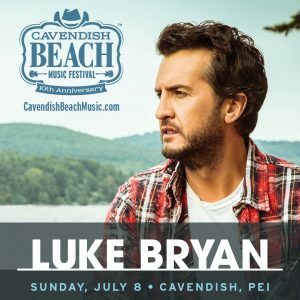 CAVENDISH, PE – Celebrating its 10th year, the Cavendish Beach Music Festival is thrilled to announce two-time Academy of Country Music and Country Music Association Entertainer of the Year, Luke Bryan. The Country music superstar will hit the stage on July 8, during Atlantic Canada’s largest outdoor music event. Cavendish Beach Music Festival running from July 6 – July 8, 2018. “We’re thrilled to be bringing Luke Bryan to Cavendish. He’s been the #1 requested artist for many years and it’s the perfect year for him to see what our festival is made of, 10 years strong! We’re looking forward to another beautiful weekend full of friends, family and the breathtaking beaches of Cavendish at CBMF 2018!,” said Jeff Squires, President of Whitecap Entertainment, producers of the annual event. Bryan has garnered 18 No. 1 singles, sold over 10 million albums and more than 40 million tracks with three billion streams. A five-time ACM Awards host, the multi-platinum selling Bryan sang the national anthem for the 2017 Super Bowl and has performed for millions of fans during multiple sold out tours. Additional artist announcements will come in the weeks leading up to the 10th Anniversary of Cavendish Beach Music Festival. Over the past 10 years, the Cavendish Beach Music Festival has grown to become Atlantic Canada’s largest multi-day outdoor music festival, attracting over 60,000 visitors a year to see some of the hottest names in country music. Past performers have included, Kenny Chesney, Blake Shelton, Keith Urban, Eric Church, Steve Earle, Lady Antebellum, Taylor Swift, Brad Paisley, Toby Keith, Tim McGraw, Hunter Hayes, Brantley Gilbert, Rascal Flatts, and country legends Ricky Skaggs, Alabama and Reba. Nominated for the 2017 Canadian Country Music Association and East Coast Music Association Festival / Event of the Year, the festival has also been named to The American Bus Association’s Top 100 Events in North America and included as a Top 10 Best Festival in Canada by the West Jet Fun N’ Festivals series. Tickets start at $169.50 + taxes and service fees and are available via cavendishbeachmusic.com.